As the old saying goes, it takes money to make money. In the case of the Bureau of Engraving and Printing (BEP), that dollar amount expenditure will be to the tune of approximately $1.4 billion. That's the price tag for a brand-new production facility under consideration to replace the BEP's historic, but inefficient, six-story main printing building and annex on 14th and C streets in downtown Washington. The current site has been used to print U.S. paper currency (all coins are printed by the United States Mint) and other federal security products for the past 105 years. The BEP is now evaluating a 100-acre parcel on the USDA’s Beltsville Agricultural Research Center (BARC) in Prince George’s County, Md., for the construction of a smaller, but more efficient, print production facility. Following a feasibility study, the BEP determined that building a new production facility outside of Washington and renovating the administrative space in its current main facility was preferable to renovating its two current facilities in the District for both production and administrative functions. If that ultimately happens, the BEP’s annex building, which dates back to 1938, would likely be excessed, and the main building would be modernized so it could remain as BEP’s administrative headquarters and also house other federal offices. Improved Security Capabilities: A secure perimeter that meets federal building security standards is not possible with the current facilities. Efficiency: A new, one-floor facility would increase efficiency as compared to the multi-floor, multi-wing operations in Washington, which, based on BEP production data, are not as efficient as operations at the newer production facility in Fort Worth, Texas. Both are ISO 9001:2015 certified. This discrepancy can largely be attributed to a more efficient production layout at the Fort Worth plant. Safety: A new facility will ensure a safer, single-floor work environment for employees working in production, and a safer facility requiring less maintenance and modernizing upgrades than the existing six-story operation in downtown Washington, originally designed and constructed more than 100 years ago. Flexibility: A new facility will allow the BEP to better flex currency production to respond to production needs that may change over time, and incorporate larger equipment not compatible with the existing production facility. According to an article in Roll Call, the Donald Trump administration projects the move would save $601 million through fiscal 2031. Roll Call reported that the BEP determined in 2017 it would cost $2 billion to renovate the main building and annex in Washington, partly due to the costs of relocating the printing equipment from the main building to the annex during the renovation period. In addition, both buildings qualify for historic designation, which also would raise the renovation price tag. "Backing out the $601 million saved by building a new facility would yield a revised cost estimate of roughly $1.4 billion, though ultimate outlays for the project are still unknown," Roll Call indicated, adding that the Treasury Department determined the new facility would require 28% less space and would lower annual operating costs by $38 million. The BEP Washington facility, along with the production facility in Fort Worth, Texas, printed a reported $233 billion worth of currency notes (roughly 7.4 billion notes) last year alone. The addition of the Fort Worth plant in 1991 was intended to better serve the currency needs of the western half of the nation and to act as a contingency operation in case of emergencies at the Washington facility. Aside from the actual printing of U.S. currency, other BEP activities include engraving plates and dies, as well as manufacturing certain inks used to print security products. In addition, the BEP provides technical assistance and advice to other federal agencies in the design and production of documents that require counterfeit deterrence. As a service to the public, it also processes claims for the redemption of mutilated paper currency. What is currency paper made of? Currency paper is composed of 75% cotton and 25% linen. 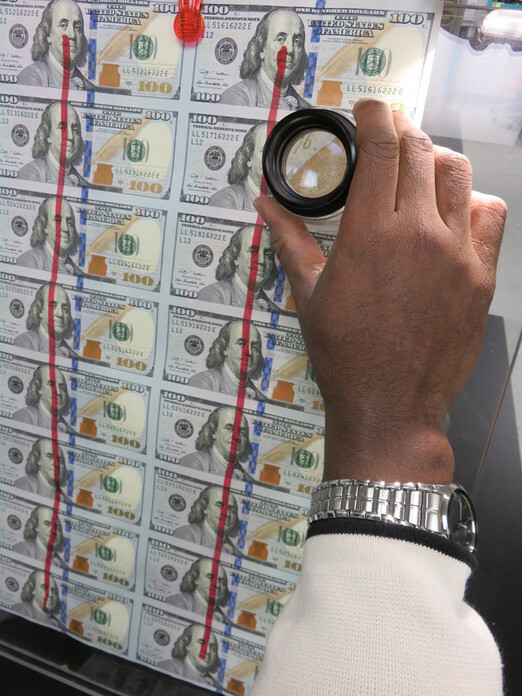 How durable is paper currency? It would take about 4,000 double folds (first forward and then backwards) before a note will tear. What was the highest denomination note ever printed? The largest note ever printed by the Bureau of Engraving and Printing was the $100,000 Gold Certificate, Series 1934. These notes were printed from Dec. 18, 1934, through Jan. 9, 1935, and were issued by the Treasurer of the United States to Federal Reserve Banks only against an equal amount of gold bullion held by the Treasury. The notes were used for transactions between Federal Reserve Banks and were not circulated among the general public. Do $3 notes exist? The Bureau of Engraving and Printing has never been authorized to print a $3 note. However, during the 1800s, banks operating under federal and state charters issued notes of that denomination. These notes were printed by private contractors and are not obligations of the federal government. Has a woman ever been pictured on U.S. currency? Martha Washington is the only woman whose portrait has appeared on a U.S. currency note. It appeared on the face of the $1 Silver Certificate of 1886 and 1891, and the back of the $1 Silver Certificate of 1896.